Most folks buy a compact car for its price and fuel efficiency. But those familiar with the Ford Focus also buy it for the driving excitement. 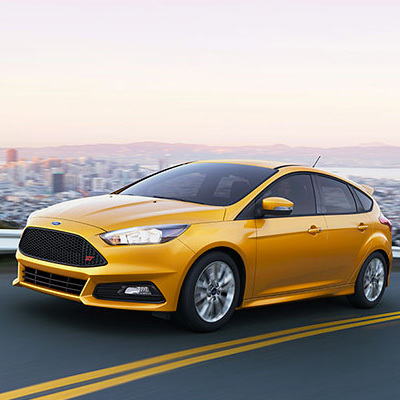 Even if you buy the standard model, the 2019 Ford Focus features torque vectoring control, a rear stabilizer bar, and a lowered, sport-tuned suspension (on the Titanium model) for quick turn in and great road feel that’ll make every drive an engaging one. The refreshed and reinvigorated 2019 Ford Focus, has arrived at our Humboldt, Saskatchewan dealership with fuel-sipping EcoBoost engines, sharp styling, and the new Sync 3 infotainment system. Check out our inventory of Ford Focus models here. We have new and certified pre-owned sedan and hatchback units in a variety of trims, such as SE, Titanium, ST, and even RS. And once you’ve found the 2019 Ford Focus you’re looking for, book a test-drive by phoning our sales consultants at (306) 682-2652. Perhaps the most tangible change to the 2019 Ford Focus is to what you’ll inevitably be using the most – the infotainment system. The latest Sync 3 system offers faster responses with the optional 8-inch touchscreen, as well as smartphone-like features including pinch-to-zoom and swiping. However, the 2019 Ford Focus is still as comfortable as ever with standard rear back up camera, steering wheel mounted controls, a small cubby that holds and charges your USB device, integrated voice commands, Bluetooth music streaming, 3D navigation, and winter-ready items like heated seats and even a heated steering wheel. The Focus has had a long a prestigious record of safety, and the 2019 model continues that streak. Your Focus can be optioned with advanced safety features like lane keeping assistance, blind spot monitoring, and Active Park Assist to take the stress out of parallel parking forever. And every 2019 Ford Focus comes standard with a host of front and side airbags, electronic stability control, and 4-wheel disc brakes, and ABS. Throw in the Ford Sync system which automatically dials 911 in the event of a collision, and it’s no wonder why the 2019 Focus earned top marks in government crash testing. Want to keep the salt and snow off the soft carpets of your 2019 Ford Focus? Then you ought to visit the Discovery Ford parts department on the north side of 8th avenue in charming Humboldt. We’ve got the latest genuine Ford accessories like rubber floor mats, winter wheels and tires, oil filters, locking wheel bolts, hood deflectors, cargo organizers, and touch up paint for your new Focus. And once your new car is due for a tire rotation, oil change, or inspection, just use our simple service appointment form it’s faster than booking over the phone!